A voice, flute and piano trio is at the same time interesting and fascinating. Soprano and flute share in part the sound range and a melodic characterization. Obviously they differ in timbre and verbal component: soprano’s tune is usually based on a text whereas the flute’s one is based only on the notes. In this trio, soprano and flute don’t redouble, but they integrate and complement each other, whereas the piano accompanies, supports and enhances them and sometimes emerges as a soloist. That’s clear in this album, which includes Italian, German and French compositions, new to the trio, composed between the early middle of the 1800s and the early middle of the 1900s. André Caplet: (b Le Havre, 23 Nov 1878; d Neuilly-sur-Seine, 22 April 1925). French composer and conductor. As the seventh child of poor parents, he learned to be resourceful and self-reliant; by the age of 12 he was working as rehearsal pianist at the Folies-Bergères in Le Havre, and at 14 he was playing the violin at the Grand Théâtre there. With his acute musical ear and his gift for sight-reading and improvisation, he made rapid progress and was soon studying harmony and counterpoint (as well as the piano) with Henry Woollett. In 1896 he entered the Paris Conservatoire, studying harmony with Leroux, fugue and composition with Lenepveu and accompaniment with Vidal. His years there were littered with prizes, culminating in the Prix de Rome in 1901, which he won at his first official attempt with the cantata Myrrha. His brilliant career as a conductor began in 1896, when he substituted for Leroux at the Théâtre de la Porte-St-Martin, Paris, and he was quickly promoted from timpanist to assistant conductor of the Colonne orchestra, also becoming musical director of the Théâtre de l’Odéon in 1898. As a conductor, and as a composer, he was a perfectionist; his meticulous preparation and painstaking rehearsal techniques led to sensitive and authoritative performances which soon attracted international attention. In October 1910 he was invited by the impresario Henry Russell to conduct at the Boston Opera Company, where he spent six months a year for the next four years, becoming the company’s musical director in 1912. As well as giving some of the best performances of Pelléas et Mélisande ever, he also continued his affair with Russell’s wife, Nina, which had begun in France and only ended when he volunteered for military service in August 1914. In 1907–8 he had developed a close friendship with Debussy, whose harmonies initially captivated him. Debussy in turn recognized Caplet’s artistry and sensitivity, praising his ‘gift for conjuring up an atmosphere’ and his ‘rare sense of proportion’ in composition (in a letter of 1908 to Jean-Aubry). Debussy also found Caplet indispensable as a proofreader (‘le tombeau des fautes’, ‘l’ange de corrections’), and entrusted him with the orchestration of Acts 2–4 of Le martyre de Saint Sébastien in 1911, as well as with conducting its first performance. Caplet’s distinguished war service came as a dividing point in his career. He was twice wounded, and the gassing he suffered permanently affected his lungs, resulting in his premature death from pleurisy. Following the Armistice, he relinquished his various conducting and teaching appointments to devote his time wholly to composition. During this secluded final period and after his marriage to Geneviève Perruchon in 1919, his esoteric Catholic mysticism deepened, resulting in Le miroir de Jésus (1923) generally considered his masterpiece. More than any of his French contemporaries, Caplet centred his art on the human (especially the female) voice, and he published virtually nothing for piano or orchestra alone. He owed most to Debussy in his eschewal of traditional thematic development and his desire to give his music a subtly unified, almost improvisatory feeling. The flute arabesques and certain harmonic progressions in an early song like Viens! 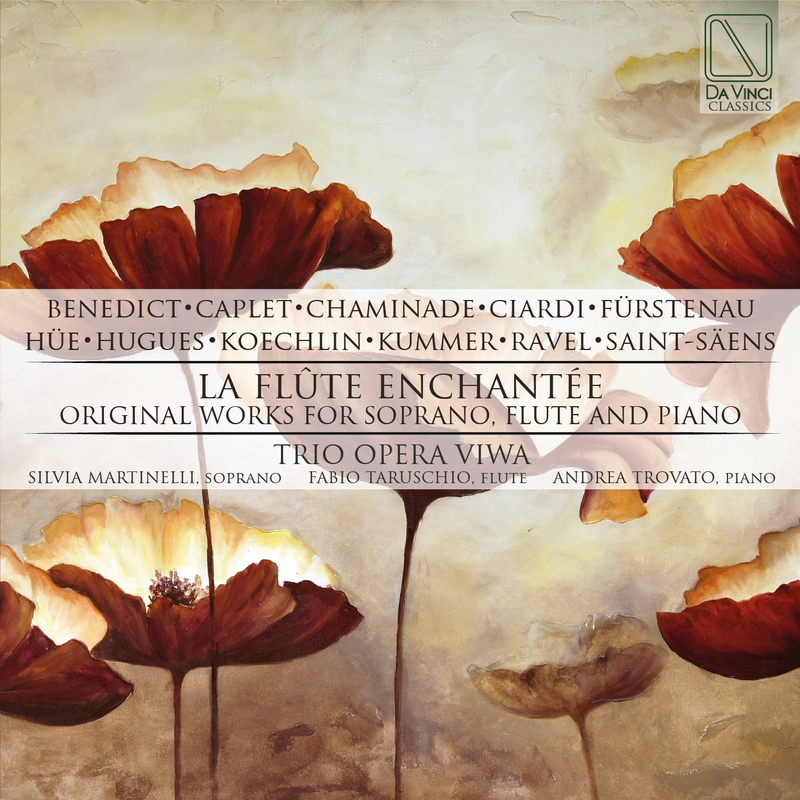 Une flûte invisible soupire … obviously owe a debt to Debussy’s L’après-midi d’un faune, but the spacious vocal lines that combine with the flute in effortless counterpoint are already Caplet’s own. Like many of his early songs, this is an unhurried miniature cantata with a quasi-orchestral piano part that is far more than mere accompaniment. The same is even more true of a song like Angoisse (from Paroles à l’absente of 1908), where both the vocal range and the intervals widen beyond the French norm. In Préludes (from the same set) we get the first real insight into Caplet’s mysterious, yet strangely satisfying chromatic world, even if the final bars still show that he knew Debussy’s La soirée dans Grenade well. The experiences of the war strengthened Caplet’s unquestioning Catholic faith, the heart of which can be seen in the Prière normande of 1916, while the torments of war are expressed in songs like La croix douloureuse and Détresse!, and his gift for exquisite simplicity in the nostalgic Quand reverrai-je, hélas! After the war, the Cinq ballades françaises reveal a new rhythmic extroversion and often a fantastical, dance-like buoyancy. The piano introductions grow into balanced preludes in their own right, and the expansive vocal lyricism becomes ever more apparent. In the Trois fables (also of 1919) Caplet can be seen at his most original as awkward vocal intervals (up to an 11th) and often aggressive harmonies are used to characterize La Fontaine’s animals to perfection in a worthy comic successor to Ravel’s Histoires naturelles. Caplet’s art is also one of constant imaginative renewal, and the way he expands the demands made on the human voice is paralleled in the virtuoso instrumental writing of later works such as Epiphanie for cello and orchestra and the Conte fantastique for harp and string quartet (inspired by Poe’s tale The Masque of the Red Death). Atmosphere and texture are all-important; traditional cadences are avoided, and often the music seems horizontally rather than vertically conceived in these powerfully intense and individual creations. However, the true heart of Caplet is to be found in Le miroir de Jésus, where the spirit of the plainsong he so much admired from his visits to Solesmes is adapted to modern techniques in a fervent, sincere and supple work of consummate beauty and tenderness which, as always, reveals to the full his refined taste and avoidance of sentimentality. Anton Bernhard Fürstenau: (b Münster, 20 Oct 1792; d Dresden, 18 Nov 1852). Flautist and composer, son of (1) Caspar Fürstenau. A pupil of his father, he made his first public appearance as a flautist in Oldenburg at the age of seven and became a member of the Oldenburg court orchestra in 1804. His frequent concert tours with his father took him to Berlin, Frankfurt, Munich, Vienna, Copenhagen and Prague, where he met Carl Maria von Weber in 1815. Partly owing to his wish to settle down and partly on account of his father’s poor health, he accepted an appointment to the Frankfurt town orchestra in 1817; there Johannes Vollweiler gave him further lessons in composition. The year after his father’s death he moved to Dresden, where he became first flautist under Weber’s direction. He continued to make numerous concert tours, and in 1826 he accompanied Weber to Paris and London; although he performed in London, Fürstenau cancelled his benefit concert because of Weber’s illness. Fétis and others praised Fürstenau’s playing for its dexterity and expressiveness; only in England did he have a poor reception, his execution being praised but his tone criticized as inferior to that of Nicholson. He continued to play on the old-fashioned flute; in his Kunst des Flöten-Spiels op.138 (Leipzig, 1909), he voiced his opposition to the new flute and its monotonous sound. A prolific composer for the flute, he wrote variations and rondos on popular opera themes by Weber, Meyerbeer, Halévy, Bellini and others. His concertos exhibit virtuoso writing and an operatic influence in their themes and style; other works for flute, however, show the influence of Weber. Cecile Chaminade: (b Paris, 8 Aug 1857; d Monte Carlo, 13 April 1944). French composer and pianist. While it is striking that nearly all of Chaminade’s approximately 400 compositions were published, even more striking is the sharp decline in her reputation as the 20th century progressed. This is partly attributable to modernism and a general disparagement of late Romantic French music, but it is also due to the socio-aesthetic conditions affecting women and their music. The third of four surviving children, Chaminade received her earliest musical instruction from her mother, a pianist and singer; her first pieces date from the mid-1860s. Because of paternal opposition to her enrolling at the Paris Conservatoire, she studied privately with members of its faculty: Félix Le Couppey, A.-F. Marmontel, M.-G.-A. Savard and Benjamin Godard. In the early 1880s Chaminade began to compose in earnest, and works such as the first piano trio op.11 (1880) and the Suite d’orchestre op.20 (1881) were well received. She essayed an opéra comique, La Sévillane, which had a private performance (23 February 1882). Other major works of the decade were the ballet symphonique Callirhoë op.37, performed at Marseilles on 16 March 1888; the popular Concertstück op.40 for piano and orchestra, which was given its première at Antwerp on 18 April 1888; and Les amazones, a symphonie dramatique, given on the same day. After 1890, with the notable exception of the Concertino op.107, commissioned by the Conservatoire (1902), and her only Piano Sonata (op.21, 1895), Chaminade composed mainly character pieces and mélodies. Though the narrower focus may have been due to financial, aesthetic or discriminatory considerations, this music became very popular, especially in England and the USA; and Chaminade helped to promote sales through extensive concert tours. From 1892 she performed regularly in England and became a welcome guest of Queen Victoria and others. Meanwhile, enthusiasm grew in the USA, largely through the many Chaminade clubs formed around 1900, and in autumn 1908 she finally agreed to make the arduous journey there. She appeared in 12 cities, from Boston to St Louis. With the exception of the concert at Philadelphia’s Academy of Music in early November, which featured the Concertstück, the programme consisted of piano pieces and mélodies. The tour was a financial success; critical evaluation, however, was mixed. Many reviews practised a form of sexual aesthetics that was common in Chaminade’s career and that of many women composers in the 19th and 20th centuries (see Citron, 1988). Pieces deemed sweet and charming, especially the lyrical character pieces and songs, were criticized for being too feminine, while works that emphasize thematic development, such as the Concertstück, were considered too virile or masculine and hence unsuited to the womanly nature of the composer. Based also on assumptions about the relative value of large and small works, complex and simple style, and public and domestic music-making, this critical framework was largely responsible for the decline in Chaminade’s compositional reputation in the 20th century. Prestigious awards began to come her way, culminating in admission to the Légion d’Honneur in 1913 – the first time it was granted to a female composer. Nonetheless, the award was belated and ironic considering that she had been largely ignored in France for some 20 years. In August 1901 Chaminade married Louis-Mathieu Carbonel, an elderly Marseilles music publisher, in what may have been a platonic arrangement; he died in 1907 and she never remarried. While her compositional activity eventually subsided because of World War I and deteriorating health, Chaminade made several recordings, many of them piano rolls, between 1901 and 1914. Aeolian produced additional piano rolls of her works after the war, now with the improved technology of the Duo-Art system. In later years, by which time she was feeling obsolete, she was tended by her niece, Antoinette Lorel, who attempted to promote Chaminade’s music after her death in 1944. Chaminade was well aware of the social and personal difficulties facing a woman composer, and she suggested that perseverance and special circumstances were needed to overcome them. Her output is noteworthy among women composers for its quantity, its high percentage of published works and for the fact that a large portion – notably piano works and mélodies – was apparently composed expressly for publication and its attendant sales (Enoch was the main publisher). Chaminade composed almost 200 piano works, most of them character pieces (e.g. Scarf Dance, 1888), and more than 125 mélodies (e.g. L’anneau d’argent, 1891); these two genres formed the basis of her popularity. Stylistically, her music is tuneful and accessible, with memorable melodies, clear textures and mildly chromatic harmonies. Its emphasis on wit and colour is typically French. Many works seem inspired by dance, for example Scarf Dance and La lisonjera. Of her larger works, the one-movement Concertstück recalls aspects of Wagner and Liszt, while the three-movement Piano Sonata shows the formal and expressive experimentation that was typical of the genre by the late 19th century (see Citron, 1993, for a feminist analysis of the first movement). The mélodies are idiomatic for the voice and well-suited expressively and poetically to the ambience of the salon or the recital hall, the likely sites for such works. The Concertino has remained a staple of the flute repertory; while it is a large-scale work and thus represents a relatively small part of her output, the piece still provides a sense of the elegance and attractiveness of Chaminade’s music. Cesare Ciardi Italian flautist and composer. Born at Prato to a Tuscan family, Ciardi eventually settled in 1853 in Russia, where he was appointed in 1862 as professor at the Saint Petersburg Conservatory and became Tchaikovsky’s flute teacher. Ciardi himself played as first flute in the orchestras of the Imperial Theatres in Saint Petersburg, including the orchestra of the Imperial Italian Opera and of that of the Imperial Bolshoi Kamenny Theatre. He died at Strel’na and was succeeded in his orchestral role by Ernesto Köhler. Ciardi possessed many talents and was also a sculptor and caricaturist. Charles Koechlin: (b Paris, 27 Nov 1867; d Le Canadel, Var, 31 Dec 1950). French composer, teacher and musicologist. He came from a rich industrial family; his grandfather, Jean Dollfus, well known for his philanthropic and social activities, had founded the cotton textile firm of Dollfus-Mieg & Cie in Mulhouse. From his ancestors Koechlin inherited what he called his Alsatian temperament: an energy, naivety, and an absolute and simple sincerity that lie at the heart of his music and character. His father, a textile designer, moved to Paris before Koechlin was born and intended his son to become an artillery officer; but Koechlin contracted tuberculosis while at the Ecole Polytechnique and this rendered him ineligible for a military career. During his extended convalescence in Algeria in 1889 he began to study music more seriously, and he entered the Paris Conservatoire in October 1890. Here he studied harmony with Taudou and composition with Massenet. His lifelong interest in the music of J.S. Bach was stimulated by the counterpoint classes of Gedalge, and he retained an interest in modal music and folksong from the history classes of Bourgault-Ducoudray. When Dubois replaced Thomas as director in 1896, Massenet resigned, and Koechlin entered the composition class of the man who was to influence him most, Fauré. Throughout his life Koechlin strove to recapture the classic simplicity and nobility of Fauré’s style with its balance of liberty and discipline. Koechlin’s life was hard but uneventful. He lived a comfortable, rather dilettante existence until after his marriage to Suzanne Pierrard in 1903, but increasing financial problems, not assisted by the war, led to Koechlin’s beginning his long career as a writer on theory in 1915, although he had started regular critical work with the Chronique des arts in 1909 and had increased his teaching activities at the same time. Until the late 1920s, Koechlin was in the forefront of Parisian musical life. With fellow Conservatoire pupils Ravel and Schmitt and with the backing of Fauré, he founded the Société Musicale Indépendante in 1909 to promote new music in opposition to the Société Nationale controlled by d’Indy and the Schola Cantorum. At Debussy’s request he orchestrated all but the Prelude of Khamma in 1912–13, and in 1918 Satie invited Koechlin to join a group called Les Nouveaux Jeunes together with Roussel, Milhaud and several others, although the project never materialized as originally intended and was superseded by Les Six in 1920. Between 1921 and 1924 a series of articles on Koechlin’s music appeared in leading musical journals, and more of it began to be published and performed. However, by 1932 Koechlin was already more famous as a theorist than as a composer, and organizing a festival of his major orchestral works in that year did little to change the situation, nor was his renown much increased by his winning the Prix Cressent with the Symphonie d’hymnes in 1936, or the Prix Halphan with the First Symphony in 1937. It was not until the 1940s when the director of Belgian radio, Paul Collaer, organized performances of his works (conducted by Franz André) in Brussels that Koechlin’s music began to regain public attention. Further recognition came with Antal Dorati’s centenary recording of Les bandar-log in 1967, and after that his powerful and original music gradually gained international recognition through publications, performances and CD recordings. Crucial contributions to this process were made by his children, Yves and Madeleine, and by devotees such as Otfrid Nies and Michel Fleury. Koechlin made lecturing visits to America in 1918, 1928 and 1937, and became president of the Fédération Musicale Populaire on the death of Roussel. His growing communist sympathies in the 1930s are reflected in his ‘music for the people’ and his work for the musical committee of the Association France–URSS, although he was never an official party member. Always abreast of the latest developments in music, he became president of the French section of the ISCM, and actively supported the music of the young at all times, provided that it did not, in his view, exploit novelty for its own sake. Musically a late developer, Koechlin began his long composing career with a period of songwriting (1890–1909). In about 1911 Koechlin sensed himself ‘capable of entering the perilous domain of chamber music’, and there began a new period which ended with the Trio op.92 of 1924. During this phase Koechlin wrote a series of instrumental sonatas, developing from the basis of the harmonic advances of the songs of 1905–9 (opp.28, 31 and 35) to the luminous polytonal style which characterizes his mature music. In orchestral composition, Koechlin went through an apprenticeship between 1897 and 1904. En mer, la nuit op.27, based on Heine’s poem La mer du nord, was the first symphonic work in which he found his ‘inspiration was sustained by an appropriate formal development’. A period of early maturity ended with the First Symphony op.57bis of 1911–15, and a second phase, which saw the composition of most of his major orchestral pieces, began with La course de printemps op.95, completed in 1925 and orchestrated in 1926–7. The seven works (opp.18, 95, 159, 175 and 176) based on Kipling’s Jungle Book stories form the core of Koechlin’s orchestral output, and the composition and revision of this cycle, which lasts less than 75 minutes in performance, occupied him for over 40 years from 1899 onwards. The scores show Koechlin at his best in each period, and the music ranges from a state of demonic energy to a diaphonous luminosity which arises from chords using superposed perfect 4ths or 5ths. His complex ideas found their most natural expression in large-scale orchestral works, and Koechlin defended the viability of the symphonic poem and the vast post-Romantic orchestra long after their vogues had faded. He was stimulated by a wide range of extra-musical subjects both natural and literary. A particular attraction to the forest in his early works achieved a more universal, pantheistic significance in the jungle of his later creations. Other subjects which recurringly ‘imposed themselves’ upon him included classical mythology, dreams and fantasy (which reflected his desire to escape from everyday reality into an ‘ivory tower’ within which he could compose freely), and the night sky, the serenity and mystery of the universe. Koechlin however was an avid self-borrower, and music ‘inspired’ by one subject could easily recur in a different context. Koechlin’s unusually wide range of musical sympathies is reflected in the eclecticism of his own works, the various styles used in each work being suggested by their subjects. His firm belief in his own imaginative powers resulted in an almost complete lack of self-criticism, and he rarely revised works with a view to making them more concise. Like Berlioz, he began his compositions with a complete melodic draft. He then proceeded by a series of progressively detailed elaborations towards his final version. This, as he saw it, enabled him to preserve the freshness of his original inspiration, and gave each work continuity and logic. It also allowed him to work on several pieces simultaneously. If the spirit of freedom which pervades both his life and works can make some of his larger pieces appear unduly sectional, and if the juxtaposition of passages of great rhythmic complexity with others almost devoid of rhythmic interest has led some critics to brand his symphonic poems as uneven, then all this pales into insiginificance beside the powerful, humanitarian vision of a work like Le buisson ardent, or the irresistible humour and vitality of the ‘Charlie Chaplin’ finale of The Seven Stars’ Symphony. The main problem is rather that Koechlin’s music needs several hearings to be fully appreciated, despite its brilliant orchestration, and this has only become possible through modern CD recordings. Happily, Koechlin was equally successful as a miniaturist, particularly in the pieces he wrote while captivated by the ‘insolent beauty’ of the female stars of the early sound film in the mid-1930s. Lilian Harvey inspired over 100 beautiful cameos (opp.139, 140, 149 and 151) in which Koechlin’s harmonic gift (undoubtedly his greatest) is shown to the full, although their virtues are qualified by their smaller aims. The same qualities, together with a childlike spontaneity, are revealed in his very individual piano pieces, notably the Sonatines op.59, which entirely lack Satie’s more adult and ironic contortions of tonality. Koechlin described his life as a ‘series of happy chances under a cloud of general misfortune’. One aspect of the silver lining was the necessity to teach, which led him to a profound study of Bach’s music that considerably strengthened his own, and an increasing interest in counterpoint, as well as in modality, is evident in the compositions of the 1930s. Koechlin’s polytonal music is never cerebral in its conception, for all its skilled craftmanship; it shows balanced concern for vertical and horizontal effect that is often lacking in Milhaud. In the 1940s Koechlin’s aim was a self-sufficient ‘art monodique’ and this led to an increasing simplicity of expression and a Classical refinement parallel to that of Debussy’s final years. His unworldly and uncompromising nature undoubtedly contributed to his neglect as a composer during his lifetime, and he attached great importance to the high opinions of his music expressed by Milhaud, Roussel, Falla, Fauré and other composers whom he, in turn, admired. In retrospect these opinions have been vindicated, and Koechlin’s originality, visionary breadth and profundity place him well above the rank of petit maître. Rather, as Wilfrid Mellers concluded as early as 1942, he ‘is among the very select number of contemporary composers who really matter’. Friedrich Kummer: (b Meiningen, 5 Aug 1797; d Dresden, 22 Aug 1879). German cellist and composer. He was the most important member of a musical family that flourished in Saxony in the 18th and 19th centuries. The son of Friedrich August Kummer (1770–1849), an oboist at the Meiningen and (from 1805) Dresden courts, he developed into a fine cellist under the supervision of Friedrich Dotzauer. Following the family tradition he also learnt the oboe, and joined the electoral court orchestra as an oboist in 1814; he did not play the cello in the orchestra until after the death of the cellist Karl W. Höckner. In 1852 he succeeded Dotzauer as principal cellist, a position he held until his retirement in 1864. Lacking the inclination to compete with cellists internationally, he remained in Saxony except for making a few concert tours in Italy and elsewhere in Germany. In addition to playing with the court orchestra, as principal cellist and as a soloist, he gave frequent chamber music concerts, notably with the younger Franz Schubert (1808–78) and Karol Lipiński (1790–1861). He was praised for his consistent strength and beauty of tone in every playing position. His ‘truly classical serenity’ provided a reliable support in ensemble playing. He taught the cello both at the Dresden Conservatory and privately, and, together with Dotzauer and Friedrich Grützmacher, was responsible for the high reputation of Dresden cellists in the 19th century; Bernhard Cossmann and Julius Goltermann were among his pupils. Kummer’s grandson, Alexander Karl Kummer, was a pupil of Ferdinand David at the Leipzig Conservatory and a distinguished violinist in London. Only about half of Kummer’s 400 compositions were published, most of these before 1851. They fall into four principal categories: virtuoso compositions for solo cello and orchestra (written primarily for Kummer’s own use); chamber music – nearly all using the cello – written to suit amateurs; elementary and intermediate studies for the cello; and some 200 entr’actes written for the Dresden court theatre. Of the solo cello works, only the Concertino en forme d’une scène chantante in D minor op.73, modelled after Spohr’s ‘vocal scene’ violin concerto, kept a place in the repertory; most of these works are variations, fantasias and potpourris on popular songs and operatic melodies. Many of the cello studies, particularly the Violoncello-Schule op.60 (Leipzig, 1839), were still in use many years after Kummer’s death. Maurice Ravel (b Ciboure, Basses-Pyrénées, 7 March 1875; d Paris, 28 Dec 1937). French composer. He was one of the most original and sophisticated musicians of the early 20th century. His instrumental writing – whether for solo piano, for ensemble or for orchestra – explored new possibilities, which he developed at the same time as (or even before) his great contemporary Debussy, and his fascination with the past and with the exotic resulted in music of a distinctively French sensibility and refinement. Julius Benedict: (b Stuttgart, 27 Nov or 24 Dec 1804; d London, 5 June 1885). British composer and conductor of German birth. His date of birth is usually given as 27 November 1804, but Squire (DNB) stated that it was generally believed to have been 24 December. Benedict’s father, a local banker, placed him under Ludwig Abeille for musical instruction; at the age of 15 he went to Weimar as a pupil of Hummel, who introduced him to Beethoven. His father, anxious for him to study with Weber, took him to Dresden in February 1821, and Hummel persuaded Weber to take Benedict as his first pupil. Weber soon treated him as a member of his family, and gave him 12 lessons a month. Benedict accompanied Weber to Vienna in September 1823 for the first performance of Euryanthe (25 October), and was present at Weber’s famous meeting with Beethoven at Baden on 5 October. When Weber left Vienna on 5 November Benedict stayed behind to keep an eye on the subsequent performances. In the summer of 1824 Weber passed him on to Barbaia, who had already secured him the post of conductor at the Kärntnertortheater. In 1825 Barbaia took him to Naples, where he became conductor at the S Carlo and Fondo theatres; he remained there for nine years as a successful conductor, pianist and teacher. He wrote three operas for Naples: despite his training they seem to have been principally in the style of Rossini. In 1834 he went to Paris, and in 1835 to London, which became his home for the rest of his long career. In 1836 Benedict was appointed conductor of the Opera Buffa at the Lyceum Theatre, where on 31 January 1837 he brought out his one-act opera Un anno ed un giorno, performed at Naples earlier in the season. He was engaged as musical director at Drury Lane (1838–48) during the period of Alfred Bunn’s management, which was also the most promising time for English Romantic opera. In addition to The Bohemian Girl, Maritana and other highly successful operas by Balfe and Wallace, Benedict brought out three English operas of his own, with more modest success. In 1848 he conducted Mendelssohn’s Elijah at Exeter Hall, when Jenny Lind made her first appearance in oratorio. He accompanied Lind on an American tour in 1850, directing most of her concerts. On returning to London in 1852 he became conductor at Her Majesty’s. His two remaining operas were produced by the Pyne-Harrison company at Covent Garden; one of them was The Lily of Killarney (based on Boucicault’s The Colleen Bawn), by far his most popular work. Meanwhile Benedict had become established in that thoroughly English institution, the provincial festival. He conducted every Norwich Festival from 1845 to 1878, the meeting due in 1851 being postponed until the following year to allow his return from the USA. He began to compose secular cantatas for the Norwich Festival in 1860, and wrote an English oratorio in 1870. He had also in 1855 founded a Vocal Association modelled on the German Gesangverein, and conducted its concerts at the Crystal Palace for ten years. He accompanied for many years at the Monday Popular Concerts, and conducted the Liverpool Philharmonic Society from 1876 to 1880. J.F. Barnett described Benedict in these later years: He was one of the busiest musicians of the time … It was said by some he composed during the night and taught during the day; notwithstanding he continued to be present at nearly every important concert or fashionable reception given by patrons of musical art … Benedict was a man of engaging manners, and, of course, quite a society man; yet … he was at all times most accessible. In 1871 Benedict, who had previously been naturalized, was knighted, together with Elvey and Sterndale Bennett. German and Austrian honours followed on his 70th birthday. In spite of his industry and reputation, he was in need of financial assistance at the end of his life: in 1884 a ‘Sir Julius Benedict Testimonial Fund’ was set up with royal patronage to raise money for him, with a Jubilee Concert at the Royal Albert Hall. He continued to teach almost until his death, which occurred suddenly from heart failure. He was twice married. The geographical progress of Benedict’s career closely paralleled that of Handel; and, as with Handel, it was the Italian influence, rather than the German or English, that formed the basis of his operatic and vocal style, despite his close association with Weber. In his earlier English operas he transferred the Rossinian idiom directly to the English situation. Perhaps for this reason he could not at first match the success of technically inferior composers such as Balfe and Wallace. He gradually learnt how to write an English ballad, and in The Lily of Killarney he at last produced a work which could equal the popularity of The Bohemian Girl and Maritana. It can be called the first Irish national opera, though without political overtones: it deliberately evokes nostalgia for old Ireland, using musical conventions established by Thomas Moore’s Irish Melodies. Several themes are pentatonic, including a sinister ‘murder’ motif (anticipated in the overture). As well as several well-written ballads there are extended scenes of dramatic tension, such as the Trio and the Act 2 finale. The scene for Danny Mann, wrestling with conflicting emotions of tenderness for Eily (the Lily of the title) and fanatical devotion to his friend’s cause, is especially powerful. In later life his music became superficially more English: he wrote choral cantatas, an oratorio, even an anthem; but to the end he was apt to plunge into a cabaletta whenever he had the chance. On the other hand, his thorough contrapuntal training, of little use in his operas, showed up well in the choral works. The Legend of St Cecilia, thought by some critics to be his finest work, has some strong choral polyphony as well as some trivial solo songs. Benedict was one of the most accomplished pianists of his day, and devoted more of his time to composing, editing and teaching piano music than to any other branch of the art. His piano style could be called pre-Lisztian, maintaining to the end the light-textured virtuosity of Field, Hummel and Weber. His concertos are worthy examples of this idiom, with by no means perfunctory orchestral parts. Most of his published piano pieces, however, are hack-work, including fantasias on operas by Balfe, Barnett, Bellini, Donizetti, Flotow, Gounod, Halévy, Meyerbeer, Verdi and Wallace; fantasias on Irish, Scottish and Welsh melodies; ‘Souvenirs’ and ‘Remembrances’ of this and that – including even Recollections of the Monday Popular Concert (1867); variations, dances, marches, and pieces with programmatic titles. His most pleasing style is a simple lyrical one, as in Evening Thoughts op.49 (1853). He published an important edition of Beethoven’s piano works; edited sonatas and other major works by J.L. Dussek, Mendelssohn, Weber and others; and prepared valuable collections of teaching pieces that throw light on his methods as a teacher. Like Balfe, he tried his hand at chamber music in later years, with modestly successful results. In purely orchestral music, he seems ill at ease in the absence of his two habitual companions, the piano and the voice. His biography of Weber, published in 1881, has proved to be one of the most important sources for that composer’s life. Trio Opera Viwa (Soprano, Flute, Piano) was born in 2007 and since the beginning had an important concert activity as in Italy as abroad, with a particular interest in the original chamber music for flute, soprano and piano, so discovering also a lot of unpublished compositions. Trio is often present in prestigious events: International Festival “Mellieha Nights” (Malta), Rovinj Ljetni Festival (Croatia), Associació Cultural Pau Casals, Morella Sonora and Opus Artis (Spain), Adenauer Stationenweg (Germany), “Riflessi d’Arte” by the Lake of Como, Brianza Classica, Società dei Concerti of La Spezia, Messina Chamber Orchestra, etc.